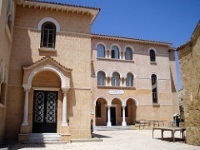 The Byzantine Museum in the Old City of Nicosia displays the largest collection of art on Cyprus. The museum contains an art gallery exhibiting oil paintings, maps, and lithographs, giving visitors insight into Cypriot culture and history. There are around 230 icons on display, dating from the 9th through to the 19th centuries and salvaged from all over Cyprus. They are beautifully preserved and make a strong impact on visitors, especially those interested in religious art and iconography. The museum also has fragments of 6th century mosaics, taken from the apse of the Church of Panagia Kanakaria at Lythrankomi.